As a community, we have too much stuff. We have so much stuff, we don’t even notice that it’s there. I became acutely aware of this recently after I broke up with my now ex-girlfriend, and moved house twice (first in with my parents, then out into my own place again). I had boxes of stuff. Books. Computer equipment. Clothes. Paper (notebooks, filing drawers, and so on). Gifts that I was hanging onto out of a sense of guilt if I threw them away. Stuff that doesn’t even have a category. So I got rid of most of it. The process took months (and I’ve never even considered myself a pack-rat), but I’m finally making headway. I never want to go back to the world of stuff again. You suddenly have a lot of spare cash. You’re not any richer, since you’ve just swapped a $10 doo-dad for $10 in cash. But it makes you feel richer, which is nice. And you can invest that $10 to get even richer, or spend it on something actually worthwhile. You appreciate the things you have more. I now look at what I have and think how lucky I am to have the things I do, rather than “oh God, I have too much stuff!”. It’s a nice change. Everything works. I can pick up any book on my shelf and know I will enjoy reading it. Every single book. Likewise, it would be very difficult to dress myself with any item in my wardrobe and not look half-reasonable, since I’ve disposed of everything that doesn’t fit, is worn out, or I just plain don’t like. Anything that I actually needed! Why get rid of something if you are just going to have to buy it again later? It’s a waste of time and money to do that. Your individual situation will determine what you actually need. Sentimental items. I’m not saying that I’ll never get rid of the stuffed teddy bears I’ve had since I was a small child, but it’s certainly not time for that yet. The antiques my grandmother gave me in her dying days will never go, despite the “where the hell will I put that?” response they caused when I received them. I used to have a huge collection of books. I had ten “In A Nutshell” books from O’Reilly. I had dozens of Penguin Classics. I had hundreds of books. Now I have twenty. When you buy a book, it can become one of four possible things. Some you’ll never finish reading because they’re awful. Some you’ll read, but you know you’ll never read again. Others you might refer to once in a while, such as a cookbook. Finally, there are those books you’ve read to death. You know every word, and yet you go back to read them again. Any book in the first two categories should go immediately. You do not want these books wasting space in your house. Books in the fourth category should definitely stay. Books in the third? Well, it’s up to you. I got rid of them if I could find the same information online, and kept them if I couldn’t. Now, how to get rid of books. If you live in Australia, this is actually incredibly simple. You put them in a box, and ship them off (with free postage) to a service that sells them online for you. It’s amazing. I love it. It’s called FishPond SmartSell. Getting rid of computer and other electronic equipment is depressing, for one simple reason: the depreciation on these purchases is incredible. 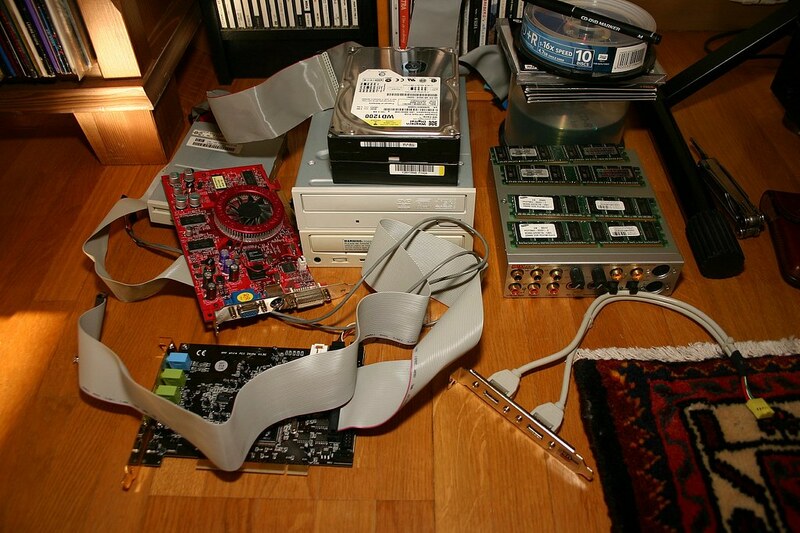 A motherboard you bought for $350 a couple of years ago is now worthless. You cannot even sell optical drives. This stuff is junk. I had a lot of computer junk. I knew it was junk, but I kept it around anyway. Patch panels. Dozens of SATA cables. A $50 printer with no ink. Sticks of RAM. All of it taking up space in my life (and in my study no less, where space is most precious). By getting rid of it, I’ve made a lot of space, and a bit of money. In Australia, the best place to sell computer equipment (and most other assorted items) is Gumtree (Americans could use Craigslist). It’s relatively easy (especially compared to the minefield that is now eBay) and has a very large user base. Unfortunately eBay is full of cheap Hong Kong sellers who sell new items for less than you can post your old items for. Don’t even bother. You’ll want to spend a bit of time getting a feel for how much items are worth, so as not to sell things for too cheap. I now basically have just a laptop, a printer, a mouse, and some external monitors. It’s all I need, and it takes up very little space. Obtain a shredder (preferably a cross-cut model such as this) and a scanner (one with a feed tray is best, such as this). You can most likely borrow these from relatives to avoid the need to buy, if you don’t have them. Make sure you have a good backup program on your computer, so you don’t lose anything (lest the tax man come after you). I recommend BackBlaze. It’s automatic and it just works. Read through the spiral-bound notebooks, ripping out any page that has what is still a great idea or a useful note in it, and shredding any page that has a password written on it. Dispose of the notebooks. Scan to PDF all of the notebook pages that you want to keep. This will be a long and tedious process, but it’s mind-numbing work, so watch TV at the same time. After you scan each page, shred it. Now move on to the filing cabinets and other papers. Some items can just be thrown out (or shredded if they have personal information). Some items can be scanned and then shredded (most things needed for tax fall into this category). Some things will need to be kept (birth certificates, car registrations, etc). Scan these anyway, it’s nice to have a backup. Put the shredded papers into the compost and make some lovely worm food. The next step is organising these PDFs into a useful form. The stuff kept just for tax purposes can just be filed away and forgotten about in the depths of your hard drive, but anything that needs to be looked at again should be organised. Is it still functional (holes, wearing, etc)? Unless I got a yes to all three questions, it went into the charity bin. Simple as that. I disposed of a lot of other items too. A lot of things I sold on Gumtree, as they had some resale value. Unfortunately, others went into the garbage. This made me sad, but it’s important to realise they didn’t become garbage when they went into the bin; they became garbage when they were no longer useful. I just hadn’t thrown them out yet. While my process of elimination and simplification is still ongoing, starting to clear out my house on a physical level has cleared out my mind too. I can see (both literally and metaphorically) the things that are important to me. I hope to never look at stuff the same way again.